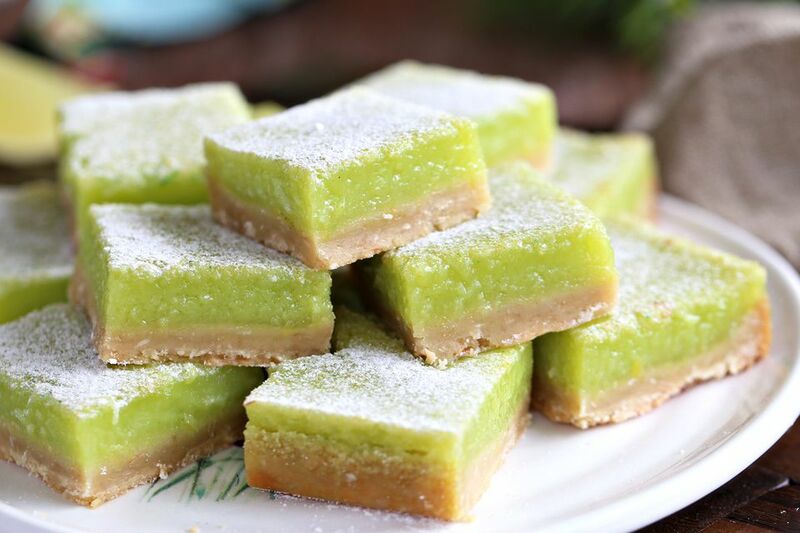 These tangy Lime Coconut Bars are a refreshing twist on classic lemon bars! They have a buttery, crunchy shortbread crust that’s studded with toasted coconut. The lime topping is wonderfully smooth and creamy, with a sweet-tart flavor that pairs perfectly with the crust. Since these bars get so much of their flavor from the lime juice, try to use freshly-squeeze juice if at all possible. Bottled juice just doesn’t compare in flavor and intensity! Preheat the oven to 350 F. Place the coconut on a rimmed baking sheet and toast it for 8 to 10 minutes, stirring every 3 to 4 minutes until it is a light golden brown. Cool completely. Use an electric mixer to cream together the butter and granulated sugar until light and fluffy. Add both extracts, then with the mixer on low, add the salt, flour, and toasted coconut. Finish mixing by hand, stirring with a spatula and scraping down the bottom and sides of the bowl well. Line a 9×13 pan with foil so that it extends up the sides, and spray the foil with nonstick cooking spray. Scrape the dough into the pan and press it into an even layer. Bake the crust for 25 to 30 minutes at 350 F, until it’s golden brown on top. While the crust is baking, prepare the filling so it’s ready to go as soon as the crust is done. In a large bowl, whisk together the eggs, lime juice, sugar, and lime zest. Sift the flour on top of the egg mixture, and whisk it in as well. Add a drop of green food coloring, if you want to use it, and whisk it in. Add a few more, if necessary, until you get a light green color you like. ﻿Go slowly—it is easy to add more coloring, but impossible to remove it if you accidentally add too much! When the filling is done baking, slide the rack part-way out of the oven. Pour the filling over the hot crust and slide it back into the oven. Reduce the temperature to 325 F and bake for 25 to 30 minutes. The bars are done when the center barely jiggles when you tap the pan. Once done, remove the pan from the oven and let it cool until it reaches room temperature. After the bars are at room temperature, refrigerate them until completely cold. To cut, remove the bars from the pan using the foil as handles, and cut into small squares using a large sharp chef’s knife. Sprinkle the top with powdered sugar before serving. Store Lime Coconut Bars in an airtight container in the refrigerator for up to a week. Pucker up for These Classic Lemon Bars!